Autumn’s arrived folks! There’s a lovely nip in the air, the leaves are turning and pumpkins, sweetcorn and mince pies are back on the menu. I love autumn; the uncertainty of British summertime means lugging around layers for any eventuality and putting all plans on hold to hit the seaside at the first sign of sunshine because you don’t know if it will be back again. You know where you are once the nights start to draw in. The weather’s either wet or crisp – no sweltering heat broken by unforseen showers. Summer was fun, especially with the Olympics and all the other fun stuff, but now we can get into our snuggly pyjamas, turn the heating back on and break open a comforting dark beer and a lovely warm mince pie (it’s never too early). I am a firm believer that dark, warm beers are for any time of the year but there’s something so soothing about a rich porter or stout to unwind with the wind and rain beating the window and regular readers know I really don’t need an excuse anyway. 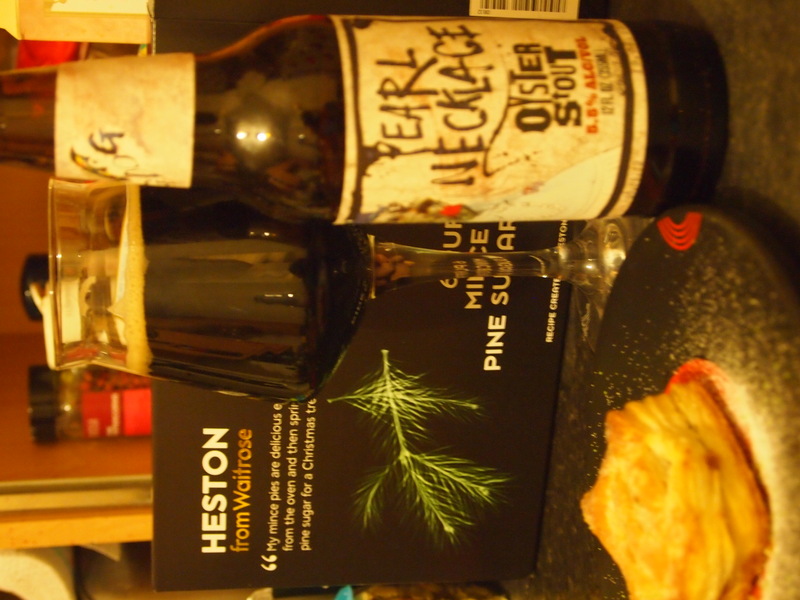 It’s been one of those weeks which has left me seriously considering throwing my pc through the window and walking out the door so, as a reward for not doing such a thing, I think I’ve earnt that insane-looking bottle of Flying Dog Pearl Necklace Oyster Stout (5.5%ABV). The label features a typically eccentric Ralph Steadman illustration of a rather Pat Butcher-ish dog in bright red lipstick and a pearl necklace which made me smile before I even opened the bottle. Pouring it out, the colour is reminiscent of Minstrels with a short-lived fluffy head. It’s quite thin, escpecially in comparison to how they do this style in Ireland, but the aroma is what you would expect of an Oyster Stout; dark roasted malts and a little fruitcake. It’s brewed with real local Oysters and money from each sale goes towards the Oyster Recovery Partnership (ORP) which is working to restore Oysters back into Chesapeake Bay so there’s a good reason to pick up a bottle. The flavour’s pretty dry and has plenty of smooth bitter cacao, but there’s also something a little woody and even a bit of salt in the aftertaste. It’s a perfectly fine stout but I’d love this beer to have a bit more oomph because it’s for a good cause and the illustration is awesome. It’s just a little too thin for my liking.